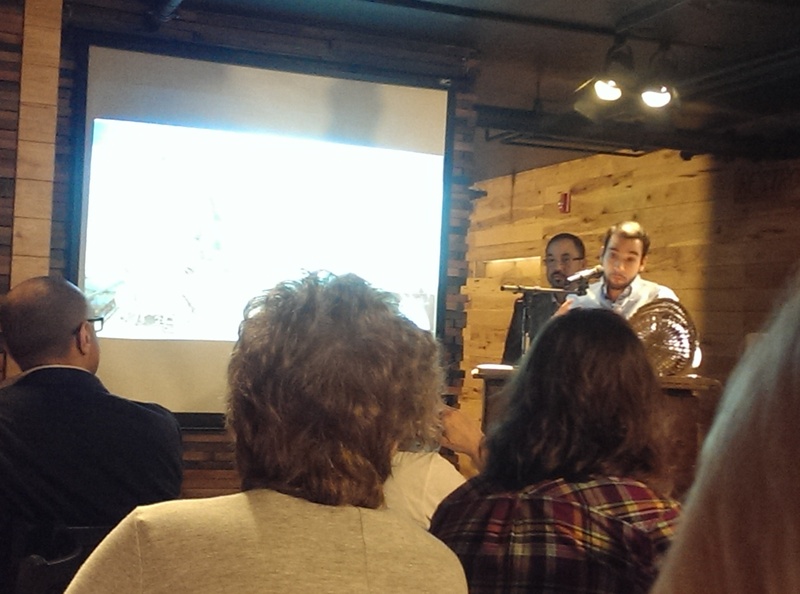 I attended a two-day event for cheesemongers and sellers this past Sunday and Monday. I learned about it in late March from one of the food forums I belong to. It was sponsored by Culture magazine. 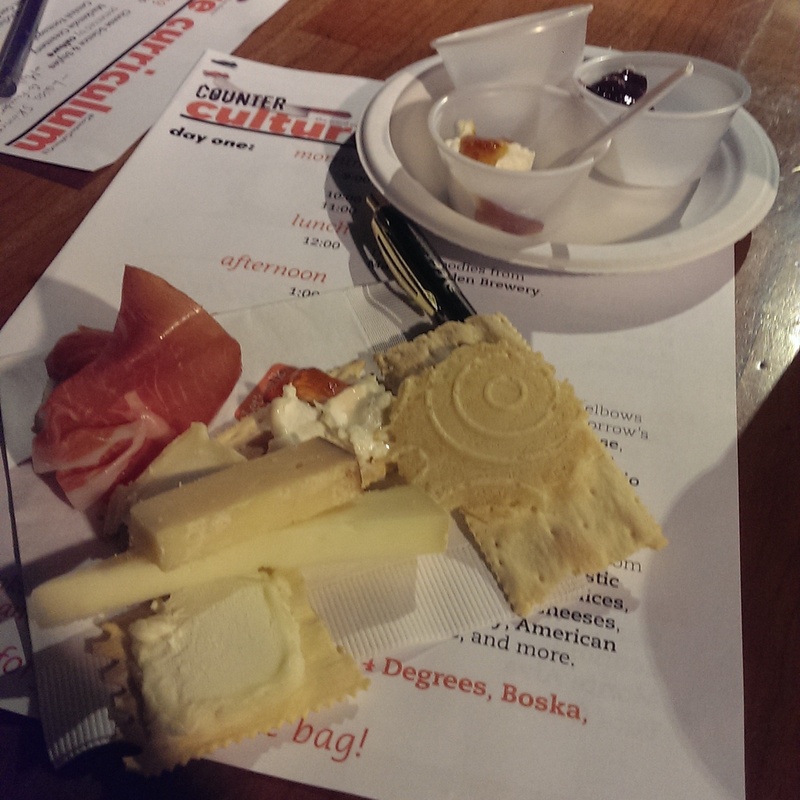 Two six hour days learning about cheese, free samples, lunch and two free drinking events for $0. I couldn’t let the opportunity pass me by, and I am so glad I did! 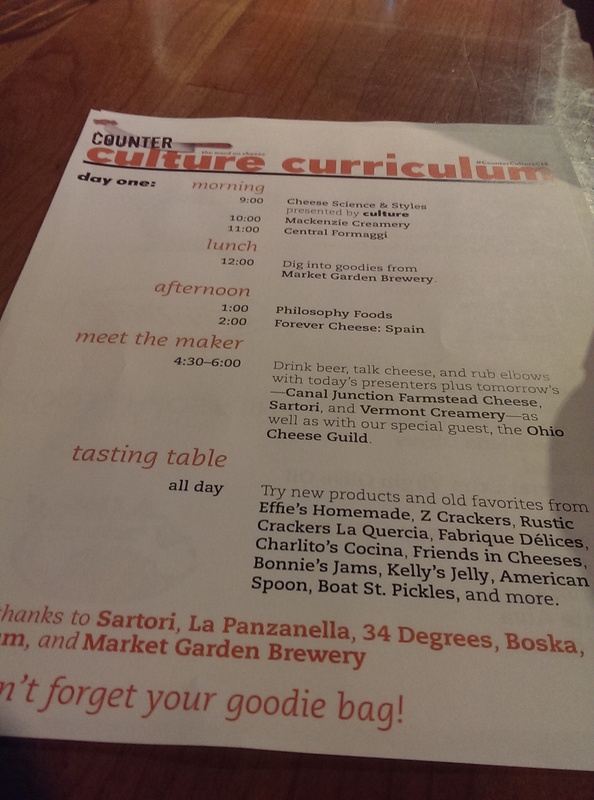 I arrived at Market Garden Brewery on Sunday morning unsure of myself, because I was not “industry.” I never mentioned that I was a local food blogger and was not approached by them in any way to write about this event. I signed up through Eventbrite when I heard about it in March. 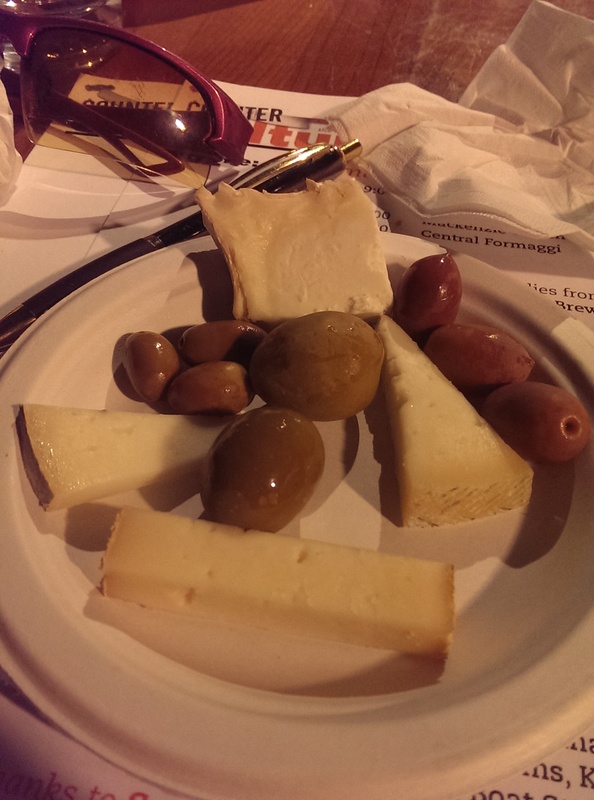 I checked in and grabbed a seat with a bunch of cheesemongers from Heinen’s. They were a fun bunch to sit with, and I enjoyed getting to know them. Another one of the women at the table works for the Cleveland Clinic and makes her own cheese on the side. I was definitely in my element. I soaked up the information like a sponge, as translators often do. I figure if I can translate a coffee table book on Bordeaux wines and vineyards someone might conceivably contact me to translate about cheese. Hey, a girl can dream. This event was amazing. 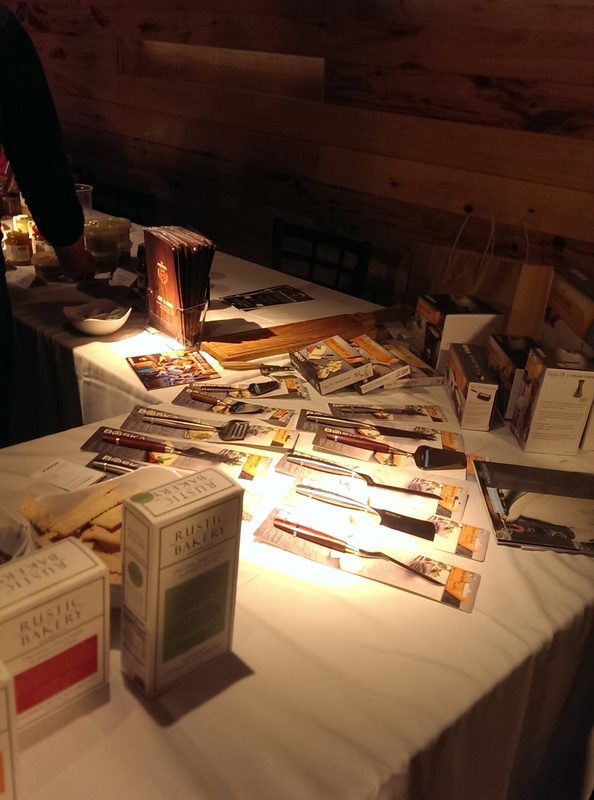 They had a tasting table available all day both days featuring the different cheeses and products. 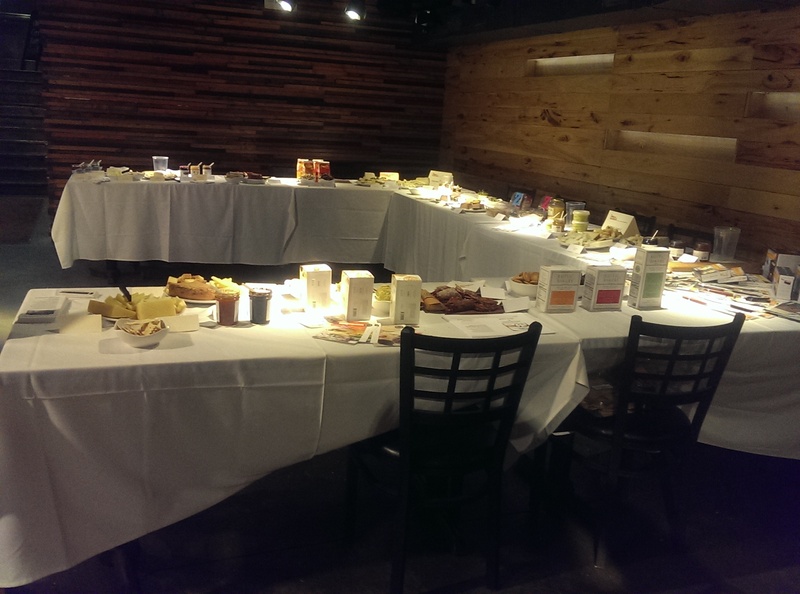 We were able to go to the tasting table during the breaks throughout the day to load up on lots of different cheeses, jams, jellies, honeys, crackers, charcuterie, dried fruit, cornichon, and Bacon Mousse and Truffle Mousse. The lemon curd was particularly divine, and I unfortunately forgot to note the name. 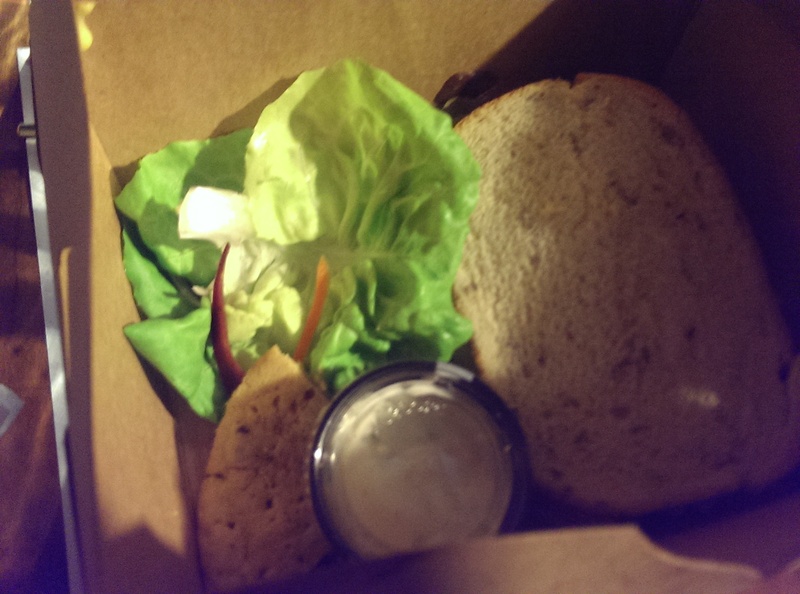 There was so much food I didn’t have room for the boxed lunch provided by Market Garden Brewery. I ended up taking it home on day one and foregoing it on day two, running out for a small scoop of Mitchell’s in the sunshine for lunch instead. 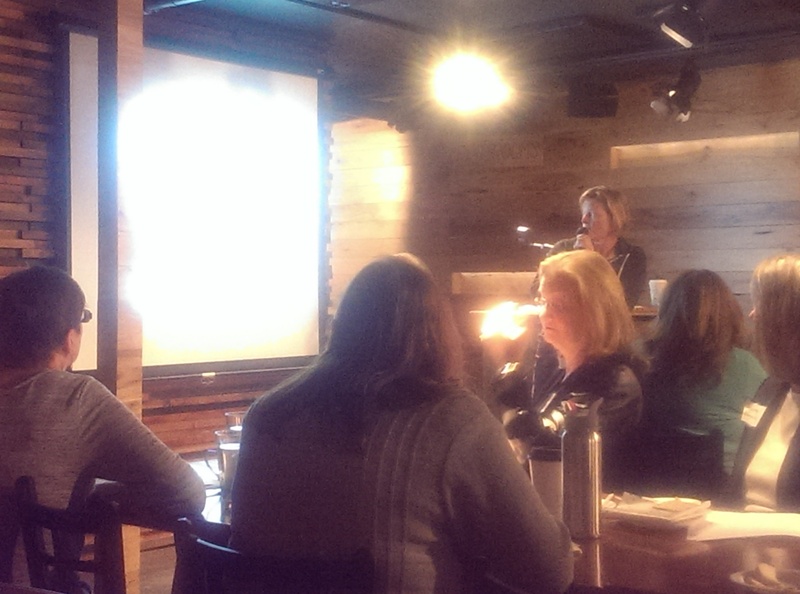 The first day started off with an hour presentation on Cheese Science and Styles presented by Lassa Skinner from Culture magazine. We learned about the various rinds (you are supposed to eat the rinds – it was a revelation) as well as the different types of cheeses and how they are made. It seemed like most of the cheeses were sheep and goat milk cheeses, which I appreciated since I often have an allergic reaction to cow’s milk. 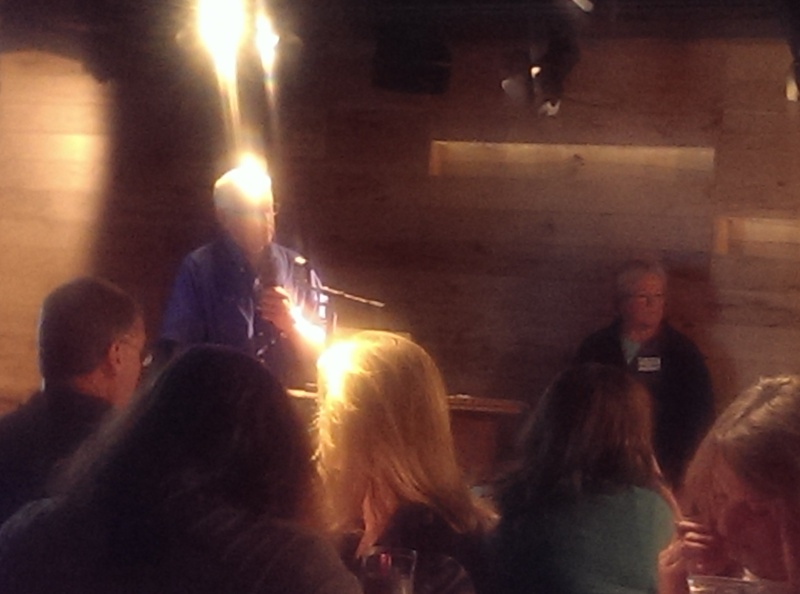 The first cheesemaker to present was Rob from our very own Mackenzie Creamery (see top of photo on the right). I was already familiar with Mackenzie as a Fresh Fork subscriber and frequent farmer’s market attendee. I love their Pumpkin Chèvre and Sweet Fire and Apricot Ginger chèvres already. 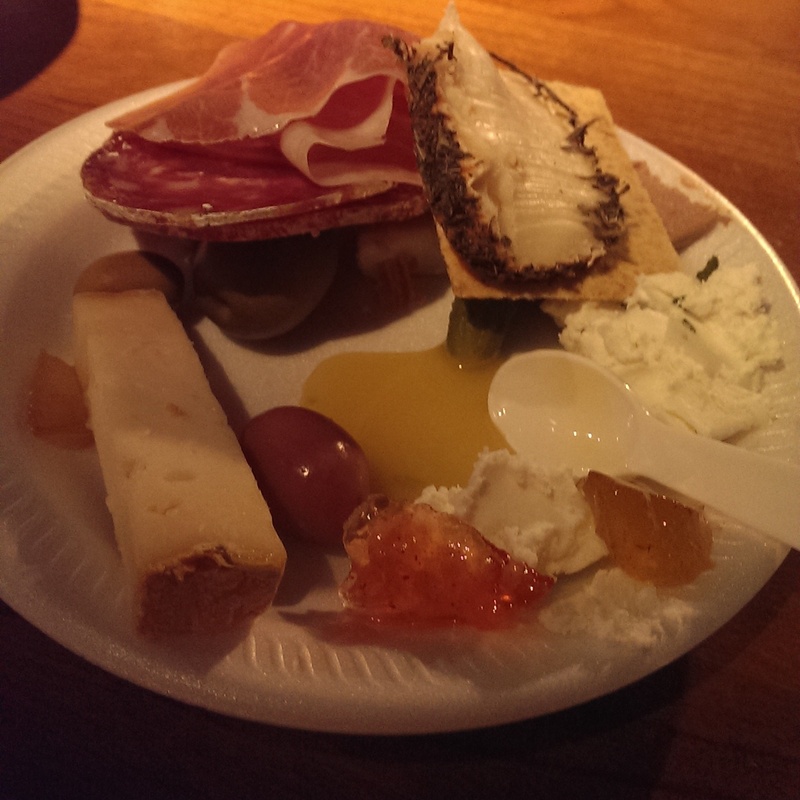 They offered us three samples to try – the garlic and chive, cognac fig, and sour cherry and bourbon chèvres. The sour cherry and bourbon chèvre is made with Jack Daniel’s and is fantastic. It is reminiscent of a Manhattan, which was the inspiration for the chèvre. They will be launching it very shortly. I was also really impressed by the garlic and chive chèvre. I am going to start buying this regularly. It was just a delightful soft cheese. The creamery gave a very good impression. Rob explained how it was a family affair, started by his mother, “JeannieGoat” when she took a cheesemaking course in 2007. Rob joined her in 2010 and has never looked back. It made me want to drive out to Hiram to check out their creamery. 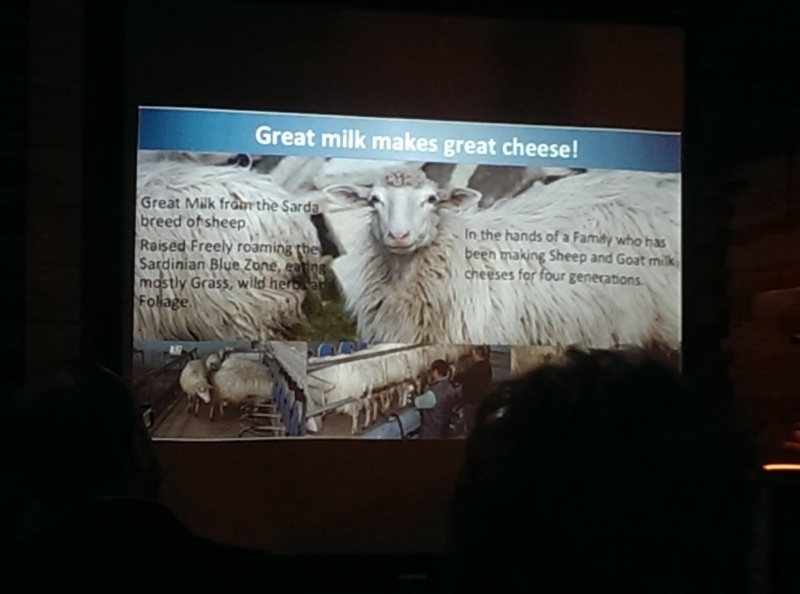 The next presentation was Central Formaggi, which is based in Sardinia. They focus on sheep’s milk cheese, as they have sheep in the mountains. They brought one of the handwoven baskets that they use to store the cheese (see podium above), which was a really great touch. The company started in the second half of the eighteenth century and modernized in 1974 to become 100% Sardinian. They centralized the many small dairies scattered all over the area into one large production center in Nureci and now produce more than 50 different cheeses (primarily pecorinos) using 15 million liters of milk. 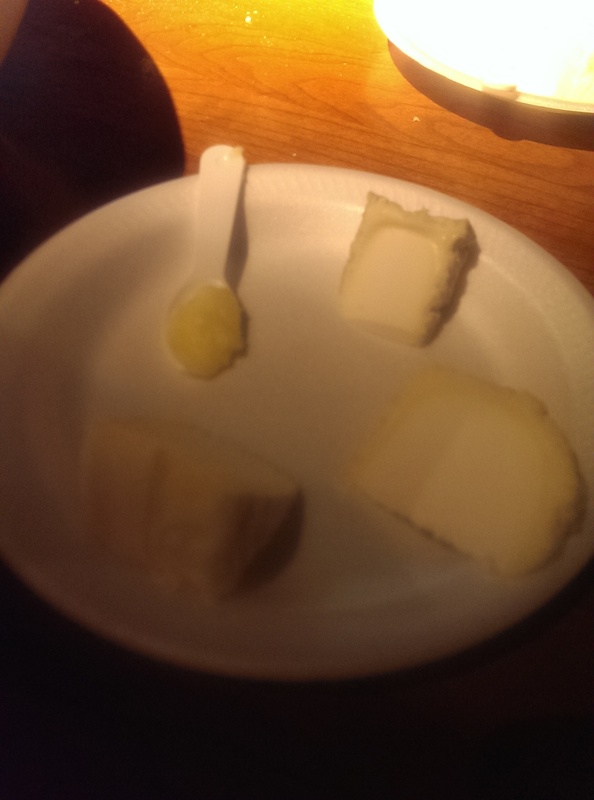 We tasted four cheeses. Their most popular is the Molitano, which is hard or semi-hard sheep’s milk cheese. 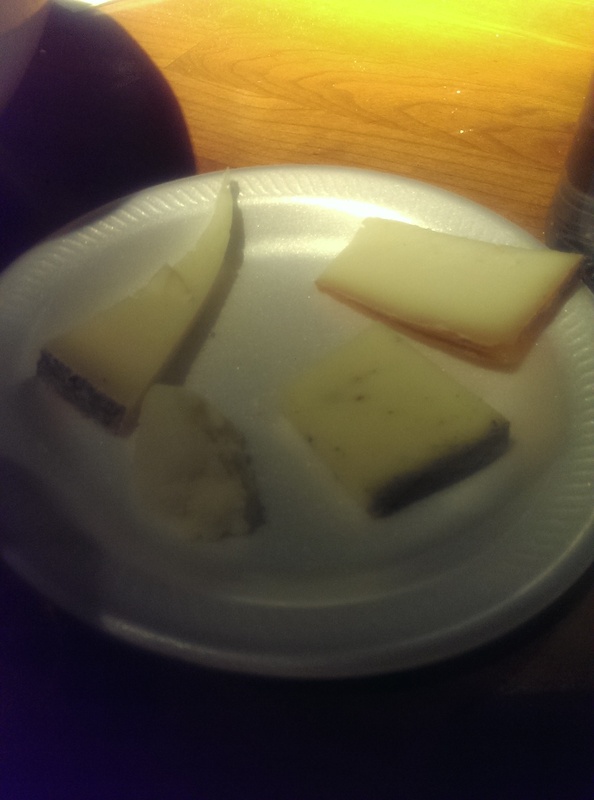 I was particularly impressed by their softer cheeses, including the Montefiore (?) and a beautiful cheese with an herb-coated rind that they have not yet released. The herb-coated cheese stuck with my palate a long time in a good way. Lunch was either a vegetarian caprese sandwich on ciabatta or a turkey sandwich on rye. It was nice, but it was hard to eat without silverware. I poured the blue cheese dressing onto a lettuce leaf and used it as a kind of wrap. As I said before, I was also so full I took most of it home. I went out for a small pho for dinner to counter all the cheese. The afternoon after the lunch break featured olives and olive oil distributed by Philosophy Foods. 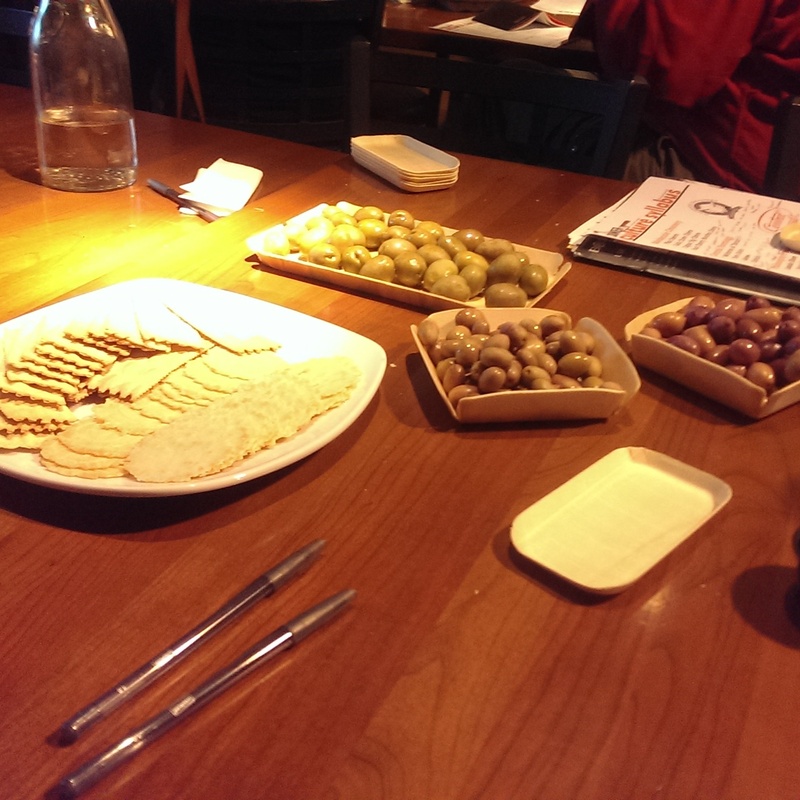 We tasted three fresh cured Losada olives from Seville, Spain, each with their own special features and flavors. I love olives, so I really enjoyed them. There was a large green cured Gordal olive with a fine pungent flavor and firm, meaty texture. The smaller olives were a Zorzaleña and a Cornicabra. The Cornicabra is a pale pink to dark purple color and is oval-shaped with a small horn on one side, which gives the name to this variety: Corni-cabra meaning “the goat’s horn.” The speaker called it a “gateway olive,” which had me laughing so hard I snorted. My favorite was the Zorzaleña, which grows wild on the side of the road in Spain. It has a firm flesh and a buttery flavor to it. I may or may not have taken more than my share of the Zorzaleña. The Zorzaleña is packed in O-Med olive oil. O-Med is a family-owned company. The olive grove and oil mill are in Acula (Granada) in southern Spain. O-Med harvests and processes their olives for their finest olive oil in one day, which I found to be very impressive. We learned how to taste test olive oil by warming the cup of olive oil in our hands and then smelling it three times. It was a very flavorful olive oil, and I could see myself using it as a dipping or finishing oil. The presentations finished with Forever Cheese, which is a distributor that sells cheese from Spain, Italy, Portugal and Croatia. Day one they focused on their Spanish cheese. My favorite cheese was the Leonora, which is a special goat’s milk cheese made by a small farmhouse producer who has only been exporting to the US for the past several years. It is lush, lemony and delicious. 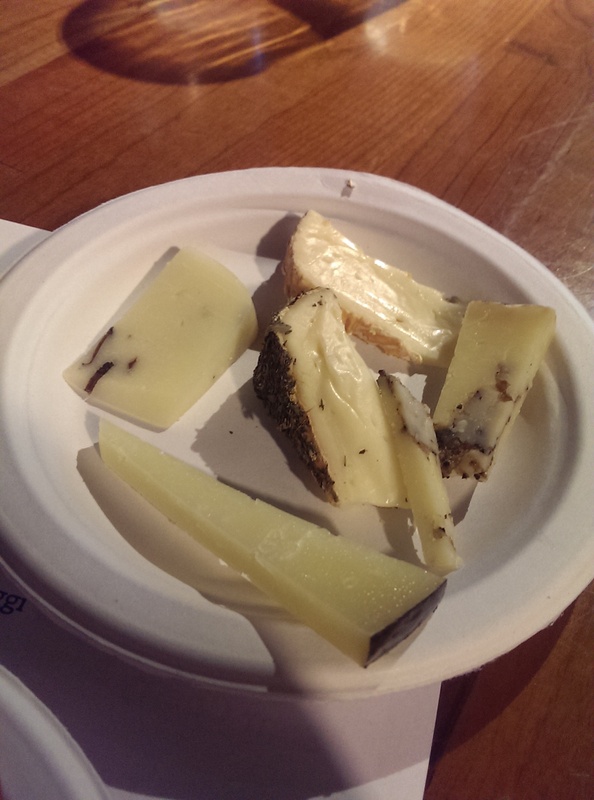 My second favorite was the Garrotxa, which is an artisanally produced goat’s milk cheese that is aged 55 days. It is the most famous Catalan cheese and I intend to try it shaved on a salad as the presenter suggested. It is distinguished from other cheeses, usually, by the mold growth on its rind. I cannot remember the other two, one may have been the Ombra. I enjoyed pairing them with the Spanish olives. I skipped the Meet the Maker beer and cheese event, because I needed to feed my critters and didn’t want to brave the crazy traffic again from the Cavs playoff game, Indians game, West Side Market and just Ohio City in general on a gorgeous sunny Sunday. I also figured it was best to leave it to the pros to talk shop. Day two started a little later (thank goodness) on Monday. I was very excited about this one because we started off learning about The Art of Mongering. I learned to keep cheese in special cheese paper or special cheese bags (by Formaticum) and not in plastic wrap! Washed rind cheeses, which are usually moist and tacky, should be kept separate from other cheeses and wrapped in paper. Cheese needs to breathe, and it is okay to let it age. “It lasts as long as it tastes good.” A little mold is good, just clean it off with either a knife or a toothbrush and you are good to go. A vinegar and water rinse works to get rid of the mold (on full cheese wheels only). It was fun hearing all the cheese sellers from Heinen’s, Whole Foods, and the West Side Market exchange tips and ideas. 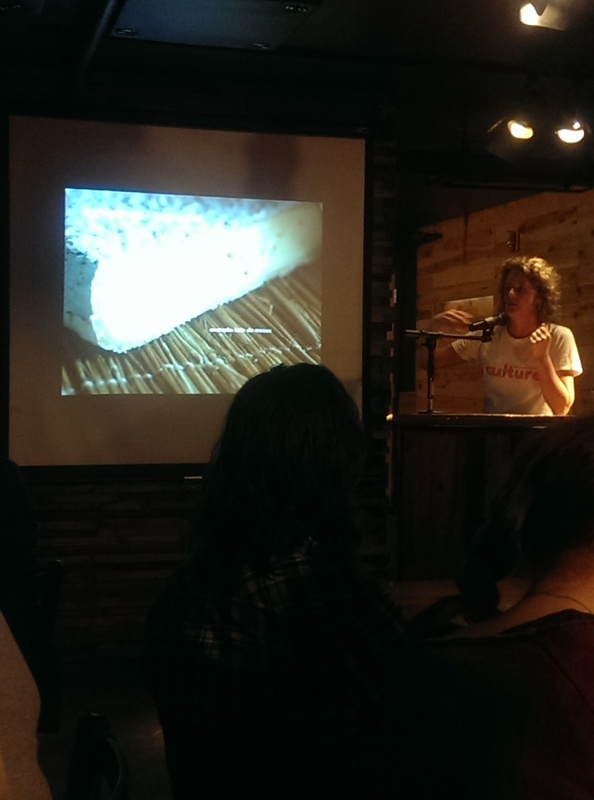 The first cheesemaker presentation was Sartori Cheese out of Wisconsin. I liked their Montamoré cheese the best, but they also had a nice pungent Parmesan. The Montamoré is a sweet, creamy and fruity cow’s milk cheese that begins with a deliciously inviting appearance and finishes with a playful, tangy bite. They have several seasonal washed rind cheeses that sound fantastic, including the Pastorale Blend, which is a blend of cow’s and sheep’s milk that is hand-dusted with paprika, and a Cognac Bellavitano that is aged for 18 months and steeped in Rémy Martin Cognac for 7 to 10 days. The Pastorale Blend is available now and will stop being produced in May. The Cognac Bellavitano is a cheese available during the holidays. 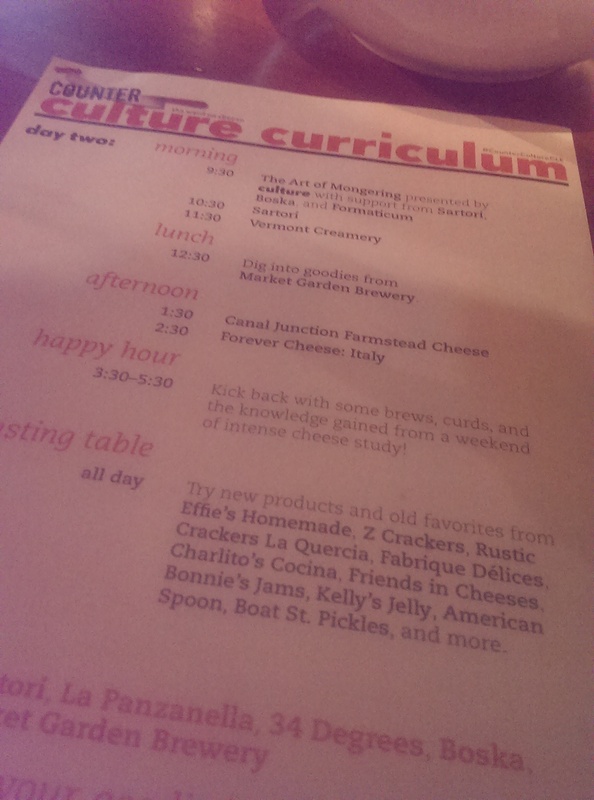 The afternoon featured Canal Junction Farmstead Cheese, which I was already familiar with through Fresh Fork. The owner was a bit intimated to follow Sartori and Vermont Creamery, but he did a great job showcasing his smaller farmstead creamery. He talked quite a bit about their trials and errors finding the perfect cows. A fifth generation farmer, he started producing cheese when his son expressed interest in cheesemaking. The son is now studying abroad, and it is up to the parents to continue the cheesemaking. If someone has a passion for cheesemaking they are looking for a good worker, as they had their best worker recently leave to join the Coast Guard. They are in Defiance, and their cheeses get their distinctive taste from the clay ground there. The cheese is crafted on the farm where the milk is produced from cows that are pasture raised there, so it is small and the definition of artisan. Their Charloe has won several awards. It is aged 2 months. It starts off with sweet cream and butter flavors it finishes with a toasted peanut essence. We also tasted the Wabash Erie Canal, Flat Rock and Black Swamp Gouda. 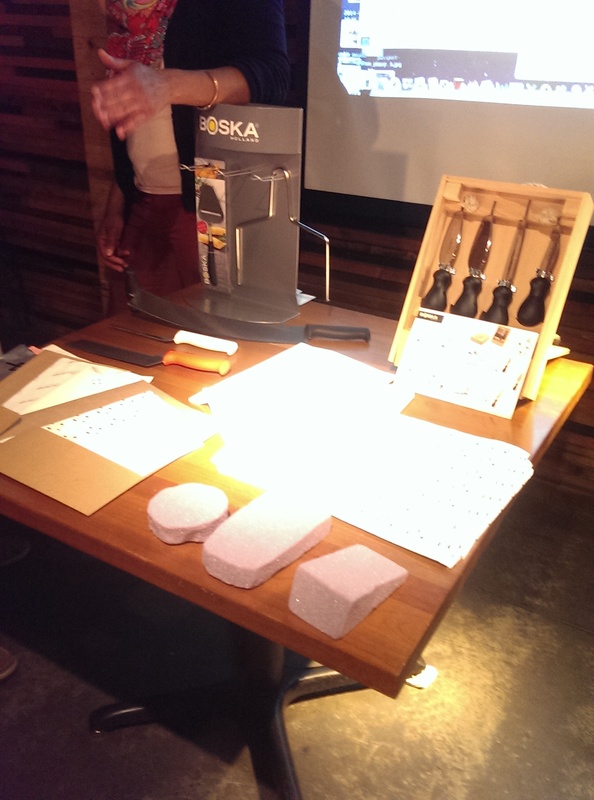 The sales and marketing guy was blown away by the cheese (I saw him mouth “Wow, this is delicious”) and Culture magazine’s Lassa, who ran the event, was almost moved to tears by his presentation. They are just a great little local creamery producing amazing cheese. The final presentation was by Forever Cheese, which took us to Italy. I was particularly impressed by the Lou Bergier Pinchin, which is a deliciously creamy cheese made from raw cow’s milk from Piemonte, Italy. I really enjoyed the flavor and will be keeping an eye out for it. 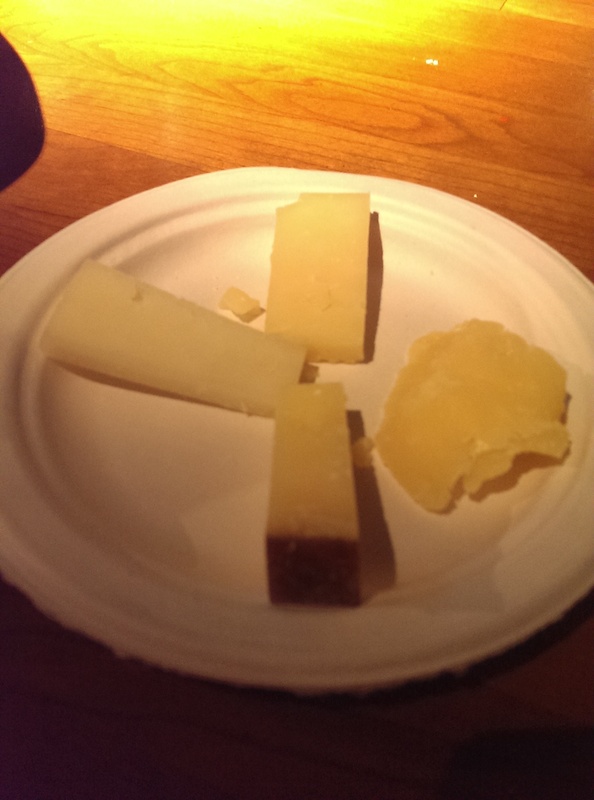 In addition to a nutty pecorino romano, we also tried a Sottocenere al Tartufe from the northern Italy area of Veneto. Aged in a coat of nutmeg, coriander, cinnamon, licorice, cloves, and fennel, the Semi-Soft paste is laced throughout with slivers of black truffle. One comment on the slide is that it is great on toast and in egg dishes. A little truffle goes a long way, but this is not as overpowering as most truffle products. It was quite nice. Finally, I thoroughly enjoyed the Quadrello® di Bufala, which is made in Lombardia from water buffalo milk. It is a Taleggio, with a soft, ivory-pink washed rind with a deliciously creamy interior. I again skipped the free beer happy hour to feed my critters, but could not wait to unpack my goodie bag. Check out all the loot! 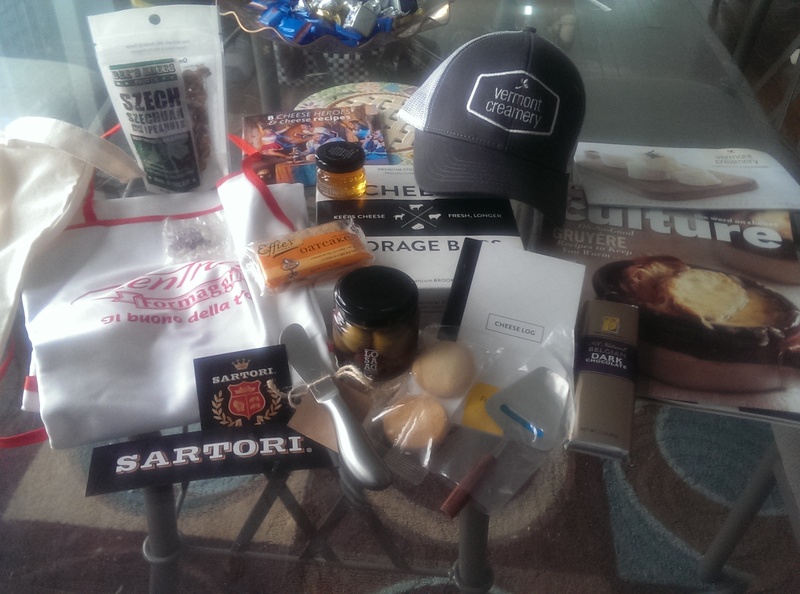 A copy of Culture magazine, several brochures, an apron from Central Formaggi, a baseball cap from Vermont Creamery, a cute little goat magnet, Bee’s Knees Szechuan Peanuts, Losada olives, Millefiori Honey, Effie’s Oatcakes, Rustic Bakery Meyer Lemon shortbread cookies, a Two Brothers dark chocolate bar, a cheese log, a mmetal cheese knife from Mackenzie creamery and the most adorable little cheese shaver. I am most excited about the cheese storage bags and the serving utensils. Not bad for an event that didn’t cost me a cent. I was completely blown away by this event and can’t wait until they return to Cleveland. Industry folks from out of town were very impressed by the West Side Market right next door and I told Lassa about EDWINS and L’Albatros’ cheese boards, so hopefully they will be back soon. I can’t wait to subscribe to Culture magazine. The sisters behind the magazine and their staff were very impressive, and the magazine has lots of good articles, information and recipes. I will also be taking a trip to Heinen’s to find some of my favorite cheeses. What a great event! I apologize for the weird lighting. The lighting in Market Garden Brewery’s basement is not conducive to photographing. If you like Wedding Soup go to Ferrera's and get some. Seriously one of the best I've ever had. Cleveland Rocks, Cleveland Eats Blog at WordPress.com.